With all the unsubstantiated rumors buzzing about a new iPhone and its alleged features, it's becoming increasingly apparent that Apple will launch some sort of new or upgraded device very, very soon -- perhaps even at its Worldwide Developer Conference (WWDC) June 8-12 in San Francisco, or maybe later this summer in a separate announcement. So what if it's wild speculation? That's what makes it fun. Today's gossip comes from PhoneArena, which posted a screenshot allegedly from the Best Buy inventory system. The image displays three AT&T phones, each with the cryptic "Project Charlie" codename. 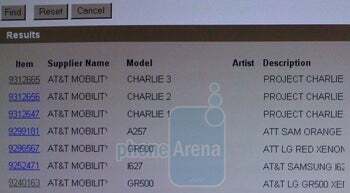 The screen grab, reportedly from a "Best Buy insider," is intriguing because the three Charlie phones shown are the only ones not identified by vendor and model name. The Charlie models are appropriately named Charlie 1, Charlie 2, and Charlie 3. Does that mean Apple will roll out three new iPhone models? One industry watcher, Barclay's Capital analyst Ben Reitzes, believes Apple will launch two new iPhones, a low-end model with less storage, and perhaps a high-end unit with front and back cameras that supports video chat. Yet another rumor is from HardMac, which reports that upcoming iPhone models will have the same shape and size as the current iPhone 3G. It's also claiming that the iPod Nano and touch are due for a September refresh, and that both will include a camera, a feature currently exclusive to the iPhone. Just a few days ago, a forum post on a Chinese Apple website listed what may be the specs to Apple's upcoming iPhone model, including 32GB of storage (up from 16GB), a faster 600MHz processor, 256MB RAM (up from 128MB), a 3.2-megapixel camera with autofocus, a digital compass, and an FM radio. Do you have an iPhone rumor? Let's hear it!